Fritz Scherer was born in Berlin in 1903 and worked as a bookbinder. In 1919, he had gone around tearing down wanted posters for the socialists Rosa Luxemburg and Karl Liebknecht. In the 1920s he attended meeting of the Anarchist Federation of Berlin which had been founded by Erich Muehsam. Every Thursday evening there were lively meetings in the working class district of Neukölln, organised by the anarchist typesetter Gustav Lübeck (1873-1945), who had married the Polish national Rosa Luxemburg in 1897 in order to gain her German nationality. Fritz was to remember Herbert Wehner speaking there on the subject “Back to Bakunin” (Wehner was to move from anarchism to Stalinism and then finish as a parliamentary leader of the Social-Democrats). Fritz also became a member of the anarcho-syndicalist union the FAUD, and collected dues for it. He also was involved in the youth activities of the anarchist youth movement and was an enthusiast of country walking. The Bakuninhütte (Bakunin Hut) 1 had been set up by anarchists as a hostel for ramblers at Meiningen in the Thuringian forest. Eventually Fritz became its keeper. He joined the Austrian Alpine Club because he found its German equivalent too nationalistic. 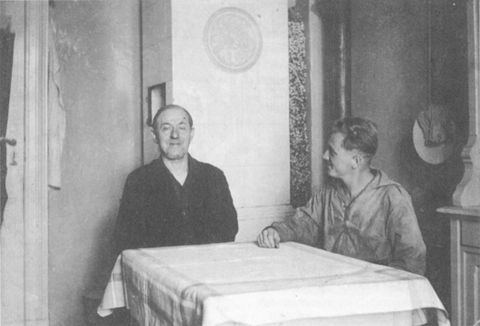 In 1933 Fritz was sharing an flat with the well known anarchist Dr. Berthold Cahn (1871-1944), a member of the Anarchist Communist Federation, FKAD) just behind the Alexanderplatz and right by the HQ of the political police. Following a raid, Cahn, a Jew , was sent to the concentration camps where he perished in 1944. Fortunately Fritz was released and then joined the Berlin Fire Department. He continued with underground anarchist activities and was arrested again in 1937, but was again released. The following year he distributed an underground poem entitled Mass Murder which denounced the Nazis and their preparation for war. During the war years, where he continued to serve in the Fire Department, he tried to do as much for old comrades as he could. He could not save Gustav Lübeck who starved to death in his bombed home in late 1945. Fritz’s wife and daughters had gone into the countryside outside Berlin to save themselves from the bombing. On visits there after the end of the war he pushed anarchist leaflets through letterboxes in the area. This came to the attention of the new Communist authorities and could have meant imprisonment or worse. Warned by an ex-anarchist Fritz fled at the last moment to West Berlin. Also in the immediate post-war period he was involved in an attempt to revive the FAUD but those who were not dead or who had emigrated were few in number. Fritz continued to live in the Neukölln district and had a huge collection of books, including a large anarchist section, bound by himself in red and black.. Some of these texts were the only surviving examples and some publishers were able to utilise these. Fritz began to participate in meetings of the Libertarian Forum in Berlin, set up by young anarchists there. A teetotaller and non-smoker, Fritz seemed a little out of place with the young anarchists who smoked like chimneys and drank a lot. Nevertheless, Fritz seemed to get on. If he really liked someone he would present them with one of the blechschildchen, little plaques for walking sticks engraved with the emblem of the Bakunin Hut. Fritz was proud to say that he had never voted in an election or entered a church. His last few years were spent in a retirement home and Fritz remained mentally alert almost to the end of his life.